There was a time when Mom thought going to the salon was a grab-a-mag and get-away experience. And with her ultra-short style, it was an every four week occurrence. But then her family-friendly hairdresser started turning and burning the barber chair faster than a three-year-old unleashed. And it was that same three-year-old yanking her green tea bag out of her mug while she was waiting her turn, family of four deep, that Mom finally had enough. 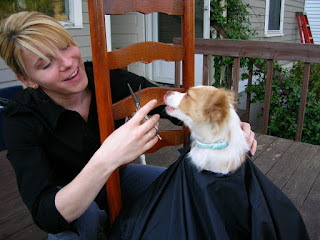 So, Mom phoned a friend, and her friend happens to moonlight as a hairdresser. Chris Spicer is museum marketing director by day; hair stylist when needed; girlfriend all day long. Before her corporate career, her post-college career was cosmetology school, then an upscale Southern California men's salon. Who would have thunk it? She stopped by the house this evening to give Mom a quick coif since Mom didn't want to be shaggy in NYC. The cost? $20. The gratuity? A glass of wine and good conversation. The scene at the salon? The back deck, an iPod of choice and the setting Macon sun. The result? Go with Mom just about anywhere, and she is constantly asked who cuts her trademark mini-tresses. She used to think it was a Macon thing until she scored a table at Atlanta's waiting list-ready Flip b/c the host liked her hair. We'll see what happens this weekend in the real City. The secret behind the scissors is out. Chris comes to you or you can go to her. Cut, color or style - with no salon overhead, she can give your head a well-done deal. Send me a Candygram to contact Chris. Pictured is me telling her, "Just a little off the top!"